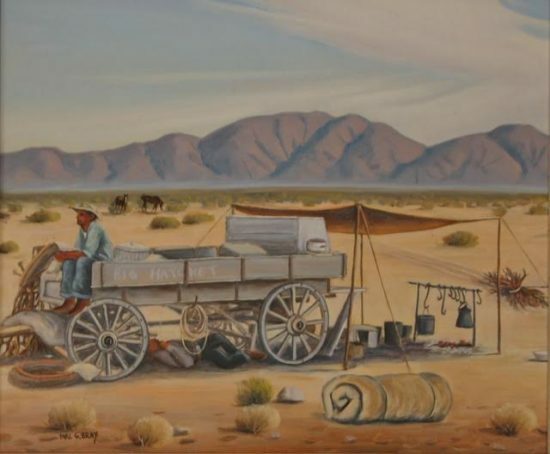 The Cathedral City Historical Society hosts the master of desert Americana, Ron Backer, at a luncheon Thursday, November 5, 2015. Backer, a transplant from South Dakota, zones in on a neighborhood and soon unearths stories even the locals don’t know; then he paints the tales so they are forever preserved. Art historian Marilyn Cooper will talk about Backer’s narrative approach, as guests enjoy a lunch by Cathedral City’s own Chef Hector. Come and meet Ron Backer and support the Cathedral City Historical Society. Cathedral City Beginnings, Ron Backer. Tourists check for deals at George Allen’s real estate office, early 1930s. Salton Sea painter Andrew Dickson shows new images of the Sea at the Art Exchange in Long Beach through October 15. Other Places: An Exhibition of Landscapes also features artists Jon Puls and Yu Ji. A professor of drawing and painting at Cal State Fullerton, Andrew has a long kinship with the Salton Sea. He began visiting his grandparents’ place in North Shore when he was only seven years old. A closing reception is set for October 15th, from 6-10 pm. Utah State University may be the first to explore links between western abstraction and Australian aboriginal imagery. Their two current complementary exhibits showcase the University’s collection of modernist art made in the American West, alongside Australian Papunya board artists. The intriguing cast of modernist painters includes Raymond Jonson (a friend of our own Agnes Pelton), Cady Wells (previously featured on CaliforniaDesertArt.com) and Henrietta Shore, a painter of California cactus who–like Pelton–has been compared to Georgia O’Keeffe. The exhibits are on view through December 12th at the Nora Eccles Harrison Museum of Art. You don’t have to go all the way to Utah to start exploring the featured artists and overlapping themes–abstraction and dreams and arid landscapes. The new Carl Bray monument in Indian Wells will be dedicated at a ribbon-cutting November 5, 2015 at 8:30 am. Following the ribbon-cutting, the original and restored Carl Bray sign will be unveiled at Indian Wells City Hall Council Chambers. Carl’s hand-painted palette sign–once torn down and tossed aside down by the City–will now permanently grace the Council Chambers foyer. 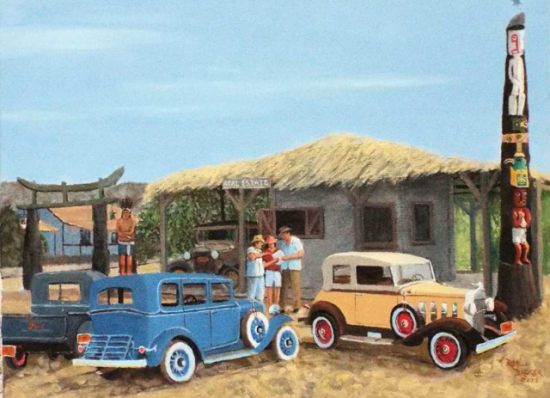 If you want to grab a vintage Carl Bray painting to mark the artist’s symbolic return home, take a look at this collection in Sun City. 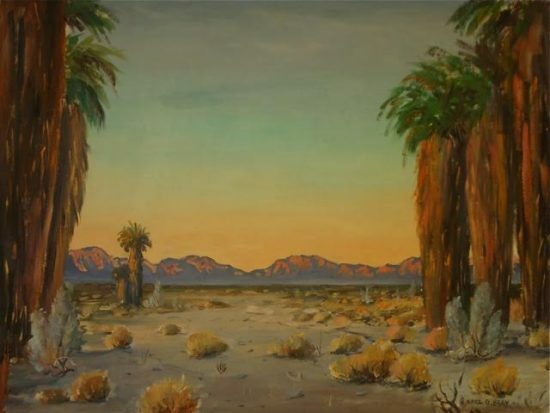 The owner lived near the Salton Sea and visited Carl’s studio frequently, gathering a collection of eight classic older paintings. If you’re interested in purchasing the collection, contact celestelesuer@gmail.com. The Desert Art Center paint-outs get started on October 10th this year with a trip to Oak Glen apple country. Leader Elaine Mathews has been guiding the excursions for years in an anti-leader, laid-back way. This is a chance to visit the best-looking places in the desert, with good company. The Desert Art Center celebrates it’s 66th year this season, so you are joining in a long tradition of desert paint-outs. The Borrego Art Institute features paintings made from pigments gathered in the desert, with brushes made from local coyote and fox fur. Artist Lauris Phillips collects fur from road-kill and other sources to craft her bamboo-handled brushes. 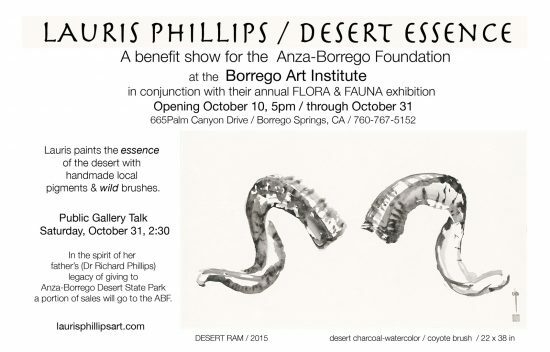 “It is Anza-Borrego painted with Anza-Borrego,” says the artist’s website. The Desert Essence exhibit (October 10 through October 31) was inspired by Phillips’ informal artist’s residency in the park, and is just one highlight of the gallery’s annual Flora and Fauna Show. The opening is October 10, 5-8 pm, with an artist’s talk October 31st at 2:30 pm. thank you dear ann, lovely, thoughtful with fruitful information of things that matter, not found any place else. well done! Love that picture of the date palms.